Recently, Johnsonville sent me a new polish sausage recipe to try. 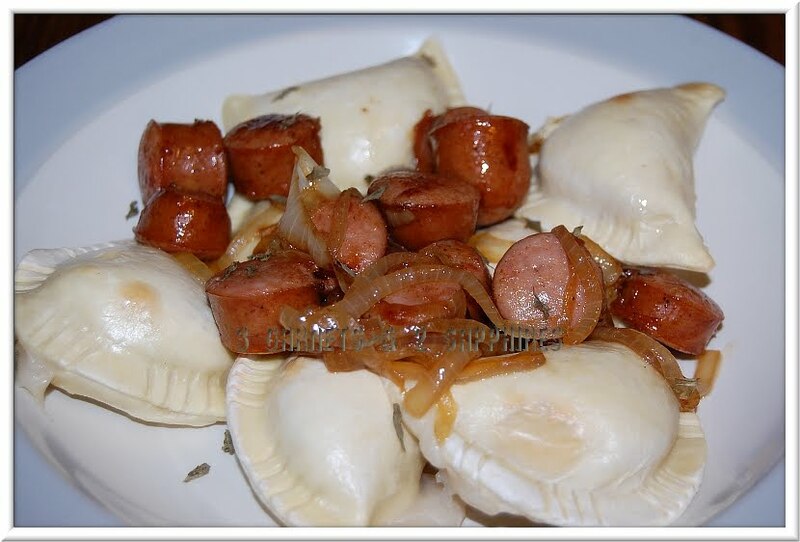 The recipe was for Polish Sausage and Pierogies. Not one person in my family, including myself, had ever tried pierogies before. Since we all love Johnsonville Polish Sausages, we were happy to give the recipe a try. I do want to point out that there are different ways to prepare the frozen pierogies. We tried to bake them and they came out a little dry on the outside and had no flavor. So I am going to suggest to saute them in a little butter in the recipe below. Step 1. Melt 1 tablespoon butter in a large skillet. Saute pierogies until tender and thoroughly heated. Remove pierogies from pan. Step 2. Melt an additional 2 tablespoons of butter in skillet. Add sliced onions and saute for approximately 15 minutes until tender, stirring occasionally. Step 3. Add cut polish sausage to onions. Cook for 5 minutes or until golden brown. Stir occasionally to ensure sausages cook evenly. Step 4. 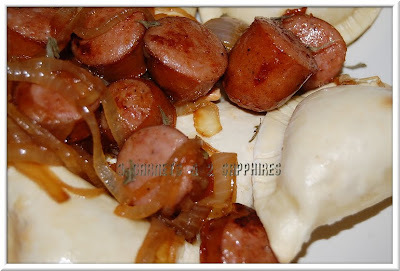 Add cooked pierogies to sausage and onions. Stir and heat for 1 minute. Step 5. Serve immediately. Sprinkle with parsley. This recipe yields approximately 6 adult size servings. To view more easy sausage recipes, visit Johnsonville.com . Thank you to Johnsonville for sending us a complimentary product sample to try out this recipe.